Bizzy Mama Hosting Review 2019: Is Bizzy Mama Hosting a Good Hosting? Bizzy Mama specializes in empowering startups, small enterprises, and home-based entrepreneurs with their e-commerce hosting and SEO services. Over the years, they've helped to plan, host, build, optimize, and market a number of small business websites. Founded in 2009, Bizzy Mama Hosting is a privately-owned company that provides e-commerce web hosting, managed WordPress hosting, and online marketing solutions for small businesses. Aside from hosting your website, Bizzy Mama Hosting will give you a set of tools to create, manage, and promote your online store. Each of their hosting plans comes with a web hosting account, web-based email account with your own domain, cPanel, and online store building software — though with the managed WordPress hosting plan, this comes in the form of WooCommerce. They also offer website setup services and SEO packages for small businesses that want to jumpstart their online marketing campaigns. Using their simple but feature-rich online store builder, you can create a functional e-commerce website that integrates a shopping cart within minutes. I liked that they offer a range of free premium templates (pre-installed) within the store admin, which allows even users with no HTML or coding knowledge to build their stores quickly. Their servers are pretty fast and they monitor uptime, security, and website speed around the clock. If you’re just starting out, I would recommend their Starter E-commerce plan. Supporting up to three domains, this package comes with a convenient, mobile-friendly online store builder, ten email accounts, 700MB storage, and 16GB monthly bandwidth. Though the storage space is quite limited, it should be sufficient for a basic online store. Their Premium E-commerce package is the other option on the table. Just like the starter package, it supports three websites. With this plan, you get the same e-store builder software as well as unlimited disk space, email accounts, MySQL databases, parked domains, and bandwidth. I recommend this plan if your website is getting a few thousand unique visitors a day. You may also want to consider their Managed WordPress plan, which supports WooCommerce. CloudFlare ready, this plan comes with the unlimited resources of the Premium E-commerce plan. You’ll get a free monthly security audit too. 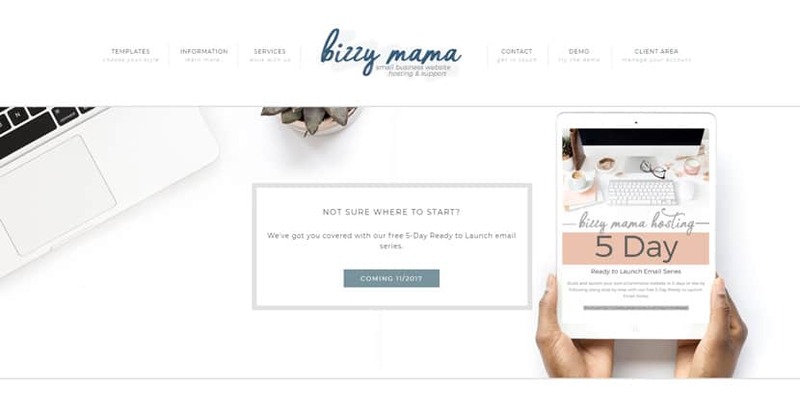 Bizzy Mama’s hosting plans are definitely on the higher end of the spectrum — their most affordable option is their managed WordPress hosting plan, but that doesn’t come with their super-convenient online store builder. I like the fact that they don’t tie customers down with lengthy contracts, although you get a 10% discount if you can commit to an annual term. My only concern is that they do charge a one-time setup fee. However, overall, they’re doing a great job as a one-stop shop for all your e-commerce hosting and online marketing needs, so don’t hesitate to give them a try. Bizzy Mama offers their customers a 30-day money back guarantee on all plans. When it comes to customer support, Bizzy Mama Hosting has definitely exceeded my standards. Even though they’re a small company, their support team reads and responds to inquiries pretty fast. They come across as people who really understand the pain points of their clients. That said, here’s where being a small company has its limitations: at this point, the only way to contact them is via support tickets, as they don’t have live chat or phone support. A fast-growing boutique hosting service with personalized support, Bizzy Mama Hosting offers decent e-commerce hosting packages in addition to WordPress hosting and SEO services for small businesses. Wondering how Bizzy Mama Hosting stacks up against other Web Hosting companies? Enter any other Web Hosting company and we will give you a side-by-side comparison.